"I love cheese!" squealed Malcolm, a plump, brown mouse. "Me too!" added Mhari, as she crawled into a hole in the block of Swiss cheese. "This is the biggest piece of cheese I’ve ever seen. It will take us a week to eat all of it!" laughed Jamie. 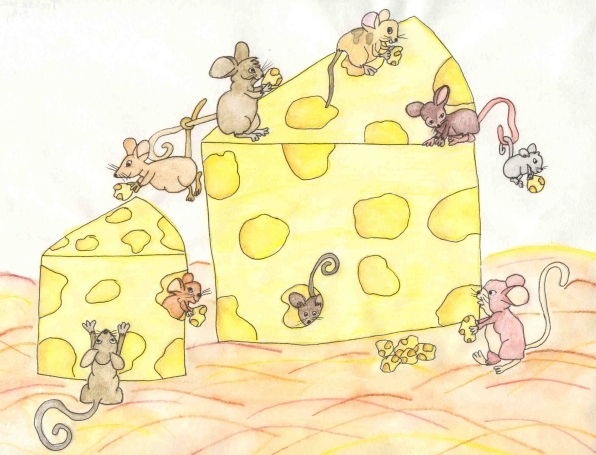 The nine mice nibbled away, breaking hunks of the delicious cheese off. Wee Hamish found a place inside the cheese and was eating from the inside out. They were so busy eating the cheese that they didn’t see Ronald sneaking up on them. His whiskers were twitching and his long, furry tail stood up in the air as he crept closer to the mice. "I wonder what that stupid cat, Ronald is doing right now?" giggled Kenny. "If only he could see us now, eating Farmer Angus’s cheese." "He’s probably snoozing in front of the fire," Malcolm replied. "Hey! Toss me down a chunk of cheese," yawned lazy Andy. Fiona nibbled off a big bit and dropped it into the hay. "Thanks," Andy said, picking up the cheese. He was about to eat it when he heard a noise behind him. Slowly he turned around. "YIKES!" he shouted and climbed into a hole in the cheese. The other mice stopped and looked. There stood Ronald, a big grin on his face. "Meow. Stupid cat, eh? Snoozing in front of the fire, am I? I hate to disappoint you, but here I am." The mice darted into the hay, crawling deep down; all except lazy Andy. He was still inside the cheese. Ronald started lifting the hay, tossing it around the shed, looking for the mice. Just then he spotted Andy’s tail sticking out of the cheese. "What have we here?" he pulled the mouse’s tail and soon Andy was dangling in the air in front of Ronald’s whiskered face. "Looks like you didn’t run fast enough. Now you’ll be my supper." Ronald was about to gobble lazy Andy when all the other mice started crawling all over him. They crawled in his ears. They crawled up his legs. They crawled through his long whiskers, under his arms and on his tail. "Get off me!" he shouted, dropping lazy Andy into the hay. " I don’t want mice crawling on me. I want to eat you all!" But the mice kept running through his fur. "Stop it! You’re tickling me!" Ronald shouted, starting to laugh. Soon he was lying in the hay laughing hard. "Get the cheese and take it back to the mouse hole," Malcolm whispered to lazy Andy. He picked up the biggest piece of cheese he could carry, and while the others occupied themselves with tormenting the cat, he took the cheese to their hole. He ran back and got another big piece. Soon all the cheese was safely stowed away. Ronald was laughing so hard that he’d tired himself out. "Let’s go!" shouted Malcolm. All the mice ran as fast as they could to the mouse hole. An hour later Ronald stopped laughing. He lay in the hay, too exhausted to move. He noticed that the mice were all gone, along with the cheese. "I hate mice!" he snarled. That night the mice finished their feast of cheese and Ronald, the cat, went to bed without any supper.